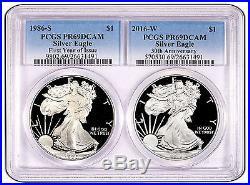 2016 “30th Anniversary Special” Silver Eagle 2-Coin Proof Set with 1st Year of Issue and 2016 30th Anniversary – PCGS PR69DCAM. Get the best of both worlds! 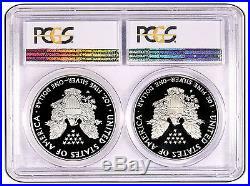 In a single 2-coin holder are the 1986 “1st year of Issue” Silver Eagle and the 2016 “30th Anniversary” Silver Eagle graded by PCGS as PR69DCAM displayed side-by-side in all of their majestic beauty. If you’re a serious collector you must add this to your collection! Grab them now before they’re all gone! NOTE: Prices subject to change based on daily gold and silver spot pricing. Please note that bullion coins, bars, and rounds are mass-produced and are not struck to the same quality standards as collector coins. The item “2016 30th Anniversary Special Silver Eagle 2-Coin Proof Set with 1st Year of I” is in sale since Tuesday, February 14, 2017. This item is in the category “Coins & Paper Money\Coins\ US\Commemorative\Modern Silver/Clad (1982-Now)”. The seller is “nycoin” and is located in East Islip, New York. This item can be shipped to United States.